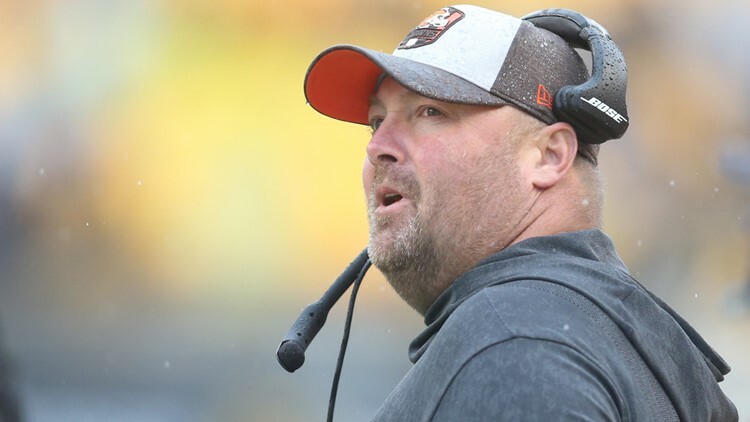 The Cleveland Browns have confirmed they have completed an interview with interim play-caller Freddie Kitchens for their head-coaching vacancy. The Cleveland Browns’ coaching search committee continued their work looking for the next full-time coach, and the process continued Friday when interim offensive coordinator Freddie Kitchens was brought in for an interview. In his end-of-the-year press conference on December 31, 2018, Browns general manager John Dorsey said that interim coach/defensive coordinator Gregg Williams was not the only in-house candidate to earn an interview for the full-time head-coaching vacancy over the final eight weeks of the 2018 regular season. Kitchens was seventh interview candidate confirmed by the Browns since starting their search last Tuesday. Last week, the Browns brought in Williams, Jim Caldwell, the former coach of the Indianapolis Colts and Detroit Lions, current Minnesota Vikings interim offensive coordinator Kevin Stefanski and New Orleans Saints assistant head coach Dan Campbell for interviews. Also, over the weekend, the Browns brought in New England Patriots defensive assistant Brian Flores and Colts defensive coordinator Matt Eberflus (Sunday) for interviews.